We were very pleased with this result as whisper had left her coat in Elgin. 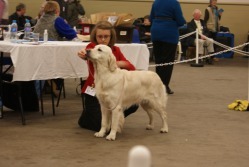 A Huge Congrats must go to Mary and Whisper's half sister Meeve (Moloko Meadghbh JW) on winning her first RCC!! 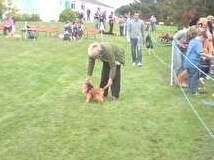 Then I got 1st in YKC Handling which offically qualifies me for Crufts 2011. Today we headed down to Fort William. 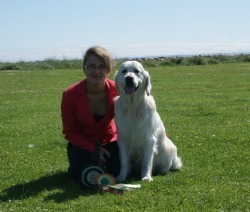 1st in Post Graduate, BOB and Gundog group 4. Thanks to the judges Mrs Jenny Wilson and Group Judge Mr Gordon Haran. Rosiele Companion Show - 5/9/2010! 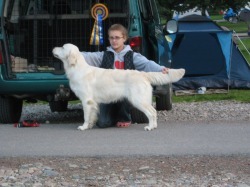 1st in triers Obedience with Sam! and Justine took whisper into Junior handler and for the first time handling she got a very good 5th out of a class of about 9 or 10. Thanks to the judges Jenny Wood and Jayne Robertson! Huge thanks to all the judges, Mr S Plane, Mrs M Gaffney, Mr D Guy & Mr G Robertson. 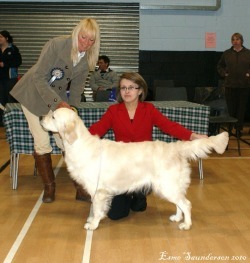 Huge thanks to Breed & Group Judge - Mrs Sharon Littlechild (Ravensett) and Junior Handling Judge Miss Nancy Farquharson. I also took a GSP in the ring and handled it to BOB. Well done To Linda and Moray who got BOB. 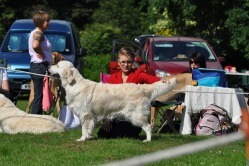 Becky also took one of Nicky Stewart's Beagles, Gabbi into her class and gained a 2nd. This was Whisper's first show after being in season and we couldn't be more happier with her placings. Also thanks to Linda Younie for taking us! Thanks to Nicky Stewart for this photo! 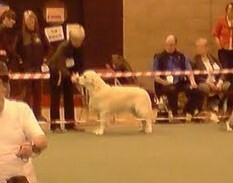 Whisper for the Breed Ring and YKC Gundog Stakes also at Crufts 2011. 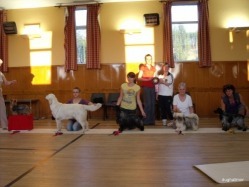 Banff, Moray and Nairn Canine club Match - 10th May 2010! Kirkcaldy Canine Society Open Show - 8th May 2010! Tay Valley Gundog Association Open Show - 2nd May 2010! 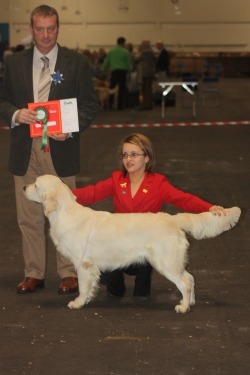 Moloko Morangie - 1st in Golden Open, BOB and Gundog Group 1!!! We went to Highland limit show today and had a very successful day! 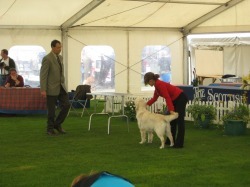 Best of Breed then went on to win Gundog Group 2. Also 1st in Junior Handling. Well done to everone else who got placed today. Yesterday we made our first trip of the year down to Edinburgh! We got 2nd to Caitlin Forbes in the YKC Handling. 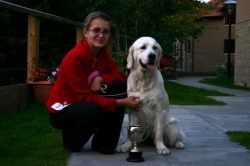 Also well done to Kirsty who got 1st in JHA, which qualifies her for Crufts 2011, Richmond - Semi Finals and Junior Handling finals at SKC 2011. 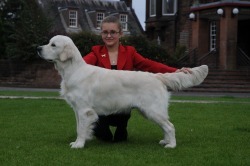 Kirsty wasn't handling her dog as she was in season, so well done Kirsty on a Brilliant Win. well done also to Caitlin, glenn and Mary Neil on their wins. Today we had our first show of 2010 at Bon Accord! 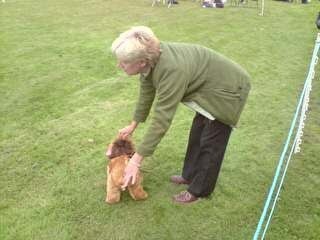 In the breed ring we were unplaced! Thanks to the judge Miss Shona Taylor and for her lovely comment to me at the end of the class! Also well done to Claire with Oscar who got BOB, to Linda and Moray for their 1st, to Ria and Jasper for their 1st in the 6-11 Junior handling class and to Kirsty and Ruby for their 5th in that class. - Reserve Best In Match! Thanks to the Judge Penny Smith! Also well done to Moray & Linda for passing their Gold good citizen award and to Kirsty & Ruby for winning BPIM! Gundog Breeds Association Of Scotland Championship Show- 14/11/09!! Today we went down to Edinburgh for GBAS. We weren't placed in the breed ring but went onto win 1st in the YKC Handling 12-16 which means we have now officially qualified for crufts. Thanks to everyone for the congratulations but special thank you to Christine Cooke (Nieghan), Mary Neil (Moloko), Mum and Grandpa for watching and supporting me through my Junior handling!! Also well done to Carole King, Christine Cooke, Mary Neil & Christine Hughes as they were all placed in the breed ring. Huge Thanks to the JH judge- David Craig. Thank you also to all the friends who donated money for Breast Cancer Care. A total of £107.60 is on it's way to the charity. Today I went to BMN Without Whisper. Today i was handling for other people and did quite well with them! I handled a Yorkshire terrier and got a 3rd. I also handled a Cavalier King Charles Spaniel (Ordiga Cecelia) and got a 3rd and a 4th. 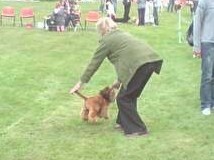 Another dog i handled was an irish setter ( Kerrymere first lady). She wasn't placed but this was the first time i had handled her and she went really well for me. 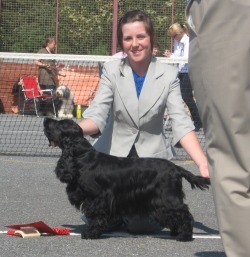 I also took Jodi's Molly into Junior Handling and got 2nd. Also well done to Claire Gray's Knockothie Brief Encounter ( Oscar)who got BOB and her Knockothie Daisy Dunnit (Katie) Who got BPIS. Thanks to all the judges today!! 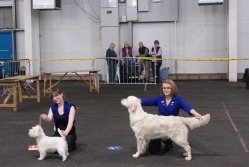 On Friday we headed down to Dumfries for the show on the Saturday. We stayed at a friend's on friday night and then went to the show on Saturday. 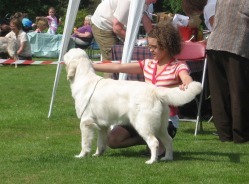 Well Done to Emma Craig for her 1st in Junior Handler! On the Saturday night we tented at Fort William to go to Lochaber Open show on the Sunday! 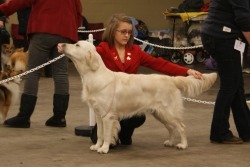 In Golden retriever Yearling Whisper got 1st. 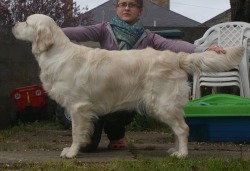 Well done to Linda Younie who owns whisper's half brother on getting BOB and Gundog group 3. This weekend we thought we would take our tent and have a double show weekend! At Lothian Whisper on Saturday was unfortunately unplaced but Whisper & Becky got 1st in 12 -16 Junior Handling and Best Junior Handler! This weekend we headed for SKC. In JHA 12-16 years Whisper and Becky got VHC. In YKC 12-16 years They got 2nd. 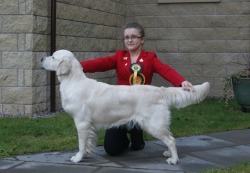 2, R M Saunderson, 14, handling a Golden Ret, she was polite, had a good rapport with the dog which she moved at the proper pace, good on the triangle. just a little of centre coming back from her T. Used the ring well on her final lap! Thanks to the judges - Mrs J Lawless & Mr Rod Price! SSPCA Companion Show!! - 22/8/09! Today we went to SSPCA Companion show at Rosiele Village Hall. 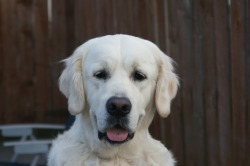 In AV Gundog Whisper got 2nd. In Junior Handling Becky & Whisper got 1st. Well done to Kirsty & Ruby who got 2nd in junior handling and to Linda & Moray for gettting 4th in AV gundog! Keith Companion Show! - 9/8/09! Today we went to Keith Companion show with Jodi again! This was her last Companion show in the UK! In AV Junior whisper got 4th and in junior handling Becky and Whisper got 3rd! In AV open Molly & Jodie got 5th and in junior handling they got 2nd! Well done Jodi & Molly! Thanks to all the judges today! Hope you have a good time in Australia Jodi & Keep in touch! Tayside, Lochee & District Open Show - 8/8/09!! Today we went to Tayside, Lochee & district open show today with jodie and what a brillant day we had all round! As Jodi is emmigrating to Australia a week on Monday this was her last Open show in the UK! In Cocker Spaniel Post Graduate Jodi & Molly got 1st and also got 1st in Cocker Spaniel Limit! They went into Best Of Breed but wasn't their day but they were really pleased of the placings in her classes! 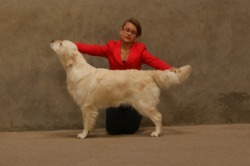 In Golden Retriever Junior Whisper got 2nd! junior handler, Jodi & Molly got 3rd and Kirsty & Ruby got a very well deserved 4th in a very big 6-11 junior handling class! Thanks to all the judges for a really good day! Today we went to turriff with our good friends Barbara & Kyle and had a really nice day with some nice wins. Thanks To Karen Forbes for the photo! Today we were at kirkcaldy and had a lovely day! Best Junior Handler In Show!!! Huge Thanks to all the judges for a wonderful day! As Becky is away on her holidays and i have not been keeping well we were not able to go to highland but our good friends Linda and Raymond took and showed whisper. 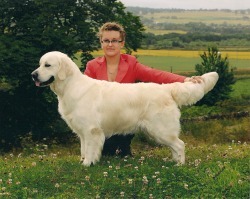 In golden retreiever junior Whisper got first then went on to win best bich and Best Of Breed at only 12 months of age! Thanks to the judge and huge thanks to Linda and Raymond for taking Whisper. Many Many thanks to Marny and Carole for the handling and the constant mobile updates!! Today we went to Bon Accord show in Aberdeen. 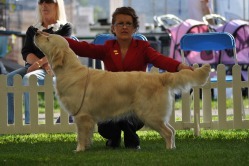 In golden retriever junior Whisper and Becky got second. In junior handling becky unfortunately got unplaced but well done to Caitlin and Jodie who got placed. 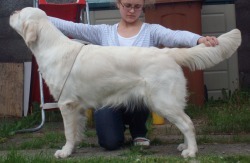 We were really pleased with the breed result as it was whisper's first time in junior. 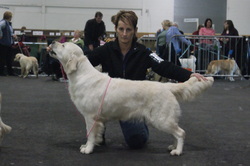 Whisper won reserve best in match. Thanks to the judge Jodie who gave whisper this award. Good Luck in Australia and hope to keep in touch. 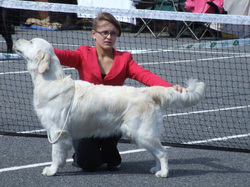 At SKC Becky and Whisper had two junior handling classes and three breed classes. Whisper was abosolutely exhausted but she still did her best in the junior handling classes. 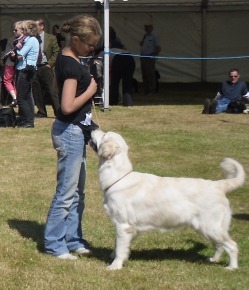 In JHA (Junior Handling Association) Whisper made Becky very proud and the judge awarded Becky and Whisper with a First out of a big class which made them qualify for the final's at crufts 2010. 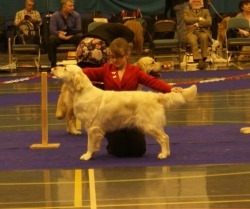 In YKC (Young Kennel Club) the judge awarded Becky and Whisper with a reserve out of another well entered class. In the breed classes Whisper unfortunately got nothing but Becky was much happier that Whisper had been a brillant girl in the junior handling classes.